How Does Being White Shape Evangelicals’ Voting Habits? It’s also a post that made me take a careful look at how we measure one of the most widely discussed groups in American Christianity: the evangelical Protestant. In the first version of the post, I noted that 60% of evangelicals voted for Donald Trump. Some readers noted that this figure was much lower than the 81% statistic that Pew reported the day after the election. What was up with the discrepancy? I was operating from a definition of evangelical that comes from the reltrad scheme, in which all those attending evangelicals churches who were not Black were lumped together. That meant the 60% assessment included Hispanic, Asian, mixed race, and other racial groups. However, when I tweaked the evangelical classification to only include whites, support for Trump shot up to 75.8%. That’s a significant difference. Once you take a look at the 2016 results for evangelical/born-again respondents from the Cooperative Congressional Election Study broken down by major racial groups, it’s easy to see why the number is so radically different. Obviously there are tremendous differences in support among White born again Protestants and Black born again Protestants. In fact, that gap is 68 percentage points. However the divergence between White and Hispanic evangelicals is also fairly large at 23%. It’s evident that a large portion of the narrative about evangelicals’ support for Trump should be tempered by what racial group is being discussed. So, how much is racial identity playing a role in voting behavior? The clearest way to isolate the impact of racial or demographic variables is a logistic regression analysis. The dependent variable is the likelihood of voting for the Republican’s candidate for president in 2008, 2012, and 2016. An effective method for understanding the results of the regression is a coefficient plot. The interpretation is straightforward, if one of the colored horizontal lines intersects with the vertical dashed line on 0, then the variable is statistically insignificant. However, if there is no intersection and it’s to the right of the dashed line, that indicates more support for the Republican candidate, if it’s to the left of the dashed line it means less support. For instance, in 2012, higher education lead to a greater likelihood to vote Republican, while it entailed a reduced likelihood of voting for Trump in 2016. For a much larger version of the coefficient plot, click here. What do we have? The strongest predictor is identifying with the Republican party, which comes as no shock. However, what is noteworthy is that the effect of partisanship was stronger in 2016 than it was in the prior two elections. 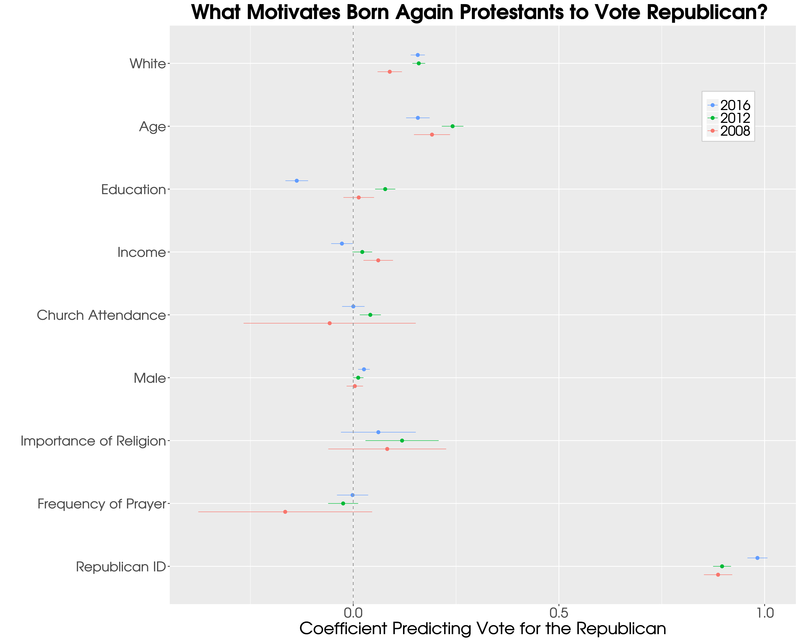 All things being equal, if a born again Protestant switched from being a Democrat to being a Republican their likelihood of voting for Trump increased by 98%. Another powerful factor is age: moving a voter from the 18-35 bracket to the 65+ category made them 16% more likely to vote for Trump in 2016. Now we arrive at the crux of the analysis: identifying as a caucasian (versus any other race, including hispanic, asian, or black) is positively related to supporting the GOP candidate. All things being held constant, a White born again Protestant was 15.7% more likely to vote for Trump than the exact same individual who was non-White. It is worthwhile to note that this effect was statistically the same in both 2012 and 2016 and therefore we can’t say that Trump activated white identity among born again Protestants anymore than Mitt Romney did in 2012 (all else equal). A quick glance at the other variables notes some interesting shifts. Greater levels of education, while being positively related to voting for the Republican in 2012, was actually negatively related to voting for Trump. Changing an individual’s education level from high school diploma to having a graduate degree made a born again Protestant 13.7% less likely to back the Republican in 2016. Trump did state that he, “loves the poorly educated” in a campaign speech and, according to these results, they love him back. In addition, the relation between higher incomes and a GOP vote has moved in the opposite direction in the 2016 election. Richer, born again, evangelicals were less committed to Trump than those from the lower end of the economic spectrum. Finally, being male had a positive effect on voting for Donald Trump in 2016 when it wasn’t a significant factor in 2012 or 2008. Time Magazine called his campaign “The Revenge of the White Male,” and the data bear that out, though males were only 2.6% more likely to vote for him. Also, the religious variables are important to note: there was no separation by observance. There were not “good” and “bad” evangelicals. They voted together to the extent their “secular” affiliations and resources allowed. There have been dozens and dozens of articles written about Trump’s “white identity politics”, but these findings are not a ringing endorsement of that story among born again Protestants. Yes, being white did drive up Trump’s support, but the same could be said for Mitt Romney and he never made racial issues a centerpiece of his campaign. The story is the same that it’s been for decades in political science: party identification is the strongest and most consistent signal, which is highly correlated with race. This subject was described at length by a recent Pew Research Center report which indicates that the differences between Democrats and Republicans has never been wider on a number of social and political issues. It is evident from Pew’s findings that no religious or cultural group is immune from this increasingly polarization. Why did born again Protestants turn out so strongly for Trump? Simply because they are strongly Republicans. Next You want young people to stay in church? Encourage them to go to college, get married, and have kids.